Will Grayson has been Tiny Cooper's best friend since elementary school. Tiny is, according to Will, "the world's largest person who is really, really gay" and constantly falling in and out of love—and dragging Will with him everywhere. When his latest attempt to hook Will up with a girl fails, Will meets Will Grayson, another teen who is depressed and discouraged. Both Wills make an effort not to feel too much in life, but are changed after meeting, and continue to change as Tiny puts on his extravagant and fabulous autobiographical musical, “Tiny Dancer”, culminating in an unforgettable and powerful night. John Green and David Levithan have created a very unique, surprising, and downright hilarious novel. The book is told in alternating chapters, and it's very easy to distinguish which point of view each author is writing from. Their characters are so different, but at the same time the book is very cohesive and engaging. Green's Will is a lot like some of his previous characters: funny, self-deprecating, and a bit nerdy and self conscious, but he is a terrific friend and an honest person. Levithan's Will is a bit darker. He is lonely and depressed, and it's evident throughout most of the book that he is hurting and doesn't know how to be himself, or even be happy. Each Will possesses his own authentic voice, and the chapters flow seamless together, playing off each other well with Tiny as a good (albeit a little self-centered) central character. The plot is complex, and the change in each Will may be gradual as each one sorts out their own myriad of problems and issues, but the journey is funny, rough, and best of all, smart (for example, Schrondinger's cat is used as an extended metaphor throughout much of the book). Will Grayson, Will Grayson is brilliant and intelligent read about love, appreciation, and feeling with an unflinching and bold style that many teens will appreciate. Cover Comments: I really like this cover! It is very fitting that since there is a musical in the book there is a spotlight on the cover, and the perspective is different. The font is also pretty cool--I like how some of the letters of the title run into each other. This is just a really excellent cover! 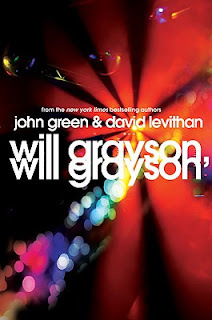 Will Grayson, Will Grayson will be available on April 6th, 2010! I am super excited for this book! Lucky you for getting it early! I just won an ARC from the Helping Haiti Heal drive and I should be getting it soon, I'm super excited! I haven't read too much of Levithan, but anything John Green writes is fantastic. I've been really looking forward to this one. I have high hopes for this book since all of John Green's disappointed me except for Paper Towns. I'm hoping this one will go the way of Paper Towns for me. I'm reading this right now and am really enjoying it so far. Loved reading your thoughts on it too- great review! !